Make paper airplanes that you can fly with your smartphone! The POWERUP DART is a conversion kit for paper airplanes that make them awesome! Simply fold and create a paper airplane, attach the DART, and fly around your backyard, the park, the office, inside your living room, wherever! 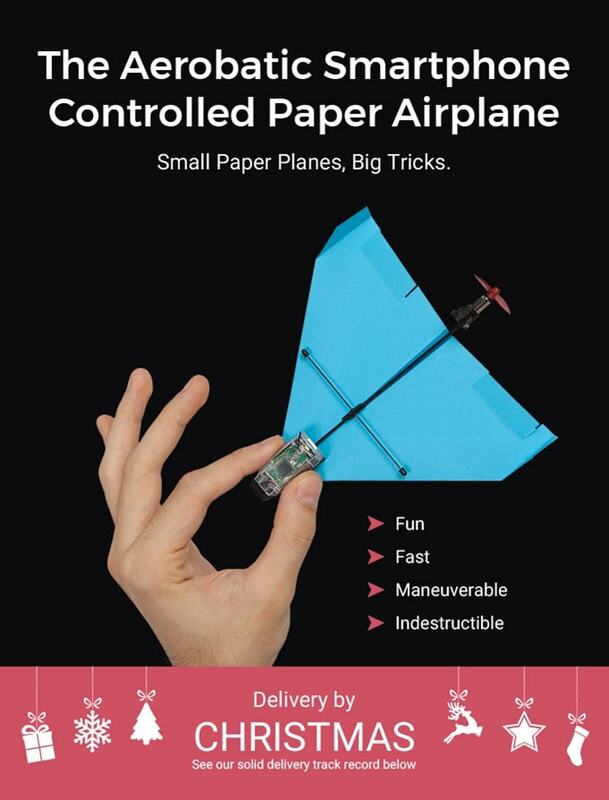 Do cool tricks with impressive accuracy with an awesome paper airplane you created yourself. Wingovers, barrel rolls, spins, loops, lazy 8’s, and more. You can perform so many tricks with the POWERUP DART. And don’t worry, the DART is pretty much indestructible. So when your plane comes crashing down to the ground you don’t need to worry about damage. The DART is easy to pair with your smartphone. Just download the POWERUP app, compatible for iPhones and Android, and use your phone to control your plane. You’ll be amazed by the accuracy of your controls! You can even get the Takeoff and Landing Gear and watch your plane takeoff at speeds up to 25mph. The DART is also USB rechargeable so when it needs to charge, simply plug it into any micro-USB charging cord. This project is live on Kickstarter now and will be delivered by Christmas. So get one for yourself and a loved one for a holiday present and have a fun time!